Many people have dreaded wearing traditional metal braces – so much so that they have elected to live with crooked teeth rather than endure the embarrassment of wearing braces. But Invisalign® technology has changed all that. This revolutionary method of straightening teeth involves wearing a series of clear plastic aligners that are virtually invisible. Dr. Brawner offers this cutting-edge teeth straightening method to his Austin, TX, area patients. Thanks to modern dental technology, nobody has to live with crooked teeth. Invisalign® aligners are every bit as effective as traditional metal braces, but without the embarrassment involved for the patient! Dr. Brawner and his staff of trained dental professionals keep up-to-date on all the latest advancements in dental technology, and Invisalign® is an excellent example of that. Dr. Brawner will fit you with a set of custom-made, clear plastic aligner trays. You’ll need to wear the trays for at least 22 hours a day, but you can remove them while you eat and to clean your teeth and gums. Every couple of weeks, Dr. Brawner will provide you with a new set of trays. Gradually, over the course of several months, your teeth will move into their new, straighter positions. Many patients report several advantages of Invisalign®. Because you can remove the trays while you eat, there are no eating restrictions that exist with old-style metal braces. You can feel free to enjoy the foods you normally do. Removing the trays also makes brushing and flossing much easier than with metal braces. 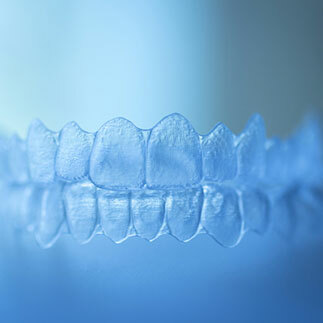 And many people report that these clear plastic trays are more comfortable to wear than traditional braces. It’s important to remember that although Invisalign® technology works great for most patients, it may not be the right choice for everyone. Contact our Austin, TX, office today and schedule an appointment with Dr. Brawner. He can help you decide whether Invisalign® is right for you.